I'm a reckless ingredient swapper. As a frugal trick, it works great. As a cooking technique...not always. Above, Pioneer Woman's chicken spaghetti becomes something that's almost as good. For quick reference, bookmark this handy list of ingredient substitutions from Allrecipes.com. For more frugal ideas, visit Kitchen Tip Tuesdays & Tasty Tuesdays! You and I are so much a like in this area. Do you know how difficult it is for me to post recipes for Tasty Tuesday? I get to typing it up, and I realize I substitute all the time. Those store bought biscuits are something I typically don't buy either (cost and health reasons), but my kids are loving the freedom to make them up whenever they are hungry (in the toaster oven, of course. :)Thanks for linking up. So funny that you are posting about this. My mother, a very good cook, has long held the opinion that anything white can be substituted for anything else, also white. Yogurt is usually what I have on hand and I use it in most cases instead of mayo, buttermilk, sour cream, cream, ricotta, or in any combination thereof! Little bits and pieces mixed together (sometimes in the food processor) work well to both use up the dregs of a container and create a more convincing substitute texture. I'm terribly guilty of ingredient swapping as well. Sometimes it works, sometimes it doesn't. :) As far as I'm concerned, though, cheese is cheese! lol! I swap out ingredients all the time. One thing I do is use hamburger to make beef stroganoff. My poor children think that's the way it's supposed to be. I made it with real strips of beef once and they said they like it the "real way" (hamburger) better. I have to follow a NEW TO ME recipe to the tee the first time, but then it's no holds barr for substituting. Whether out of necessity or taste preference. I am all about the frozen bags of onions and green peppers..they last longer and you get more yield....sounds like a yummy ole dish. I do this all the time, too. One of the reasons I have a hard time passing a recipe off to my DH and letting him cook. I have to say, "Well, I was going to use this instead of this, and leave out this..." His mind blows up and then I have to cook anyway. I have cooked for 37+ years of marriage. I usually follow a recipe pretty close the first time, but the 2nd time I make something it is 'mine' and I change it to suit what I have. I am cooking 4 pounds of chicken right now. Tonight will be chicken and dumplings and chicken for sandwiches the rest of the week. Your dinner looked very good. I am sure it was very tasty. I substitute all the time! It's a great way to save $$. I'm with the others here - I substitute all the time. No recipe is safe around me. I don't make the same thing the same way twice. I even mix cold cereal if there is only a little in each of the boxes. I am this way also. Everything almost always works out as good or even better. My mom taught me this and it is such a great lesson to know. http://www.foodsubs.com/ is also pretty handy! I substitute all the time...the only bad thing is when people ask me for the recipe and I made 3 or more changes to the original! THANK YOU for the link to the homemade condensed soup recipe....I have to avoid MSG and that is impossible to do unless I can afford organic. I'm an Ingredient Swapper, too. Since I coupon and stockpile, let's just say that my pantry doesn't always have breadcrumbs in it, but it just might have ritz crackers! It doesn't ALWAYS have green onions in it (for color), but I might have some bok choy. And onions? Well, a pinch of onion powder will do in a ...ha, well, pinch! Last night for my BF's birthday, I was going to make Thyme Pork Chops and Rice with Peas, until I realized that...well, I was out of Thyme, and well...I had a bottle of Asian marinade that would go bad in about two weeks. So... I made Asian pork chops with peas and rice! It worked out perfectly since all I had was short-grain rice (the recipe called for long-grain), this marinade and seasoning salt (the recipe called for thyme, basil, oregano, a bit of rosemary and a pinch of salt and pepper), and a little butter (all I had was olive oil!). Since I'm moving in a month, going out and buying new ingredients just isn't going to happen. I must eat down my foodstock! Oh, also, I'm a Recipe Changer too, even before I make a "new" recipe for the first time. I'm a picky eater, so if it calls for things like eggplant or red peppers, I switch them out for things I know I like and hope for the best! I substitute things all the time, but more to deal with food allergies. BUT, by being creative and willing to expirement, you can frequently make do without a trip to the store. I've been following your blog since Blissdom 09 and enjoy it so much. I too substitue ingredients in an effort to save and make some things a bit more healthy. Oh, Meredith, I hear you. Sometimes I feel like I never make a recipe as written. What I seem to do is kind of moosh two similar recipes together to accommodate what I have on hand. And it usually works our. I also do the same color--same thing theory. I use yogurt for everything whitish. I guess I'm the only one who has trouble swapping ingedients must be the OCD in me! ), but I'm getting better. Just last night, I was making a recipe for baked ground beef and rice. I was doubling it, so I needed 2 cans of cream of mushroom soup and 2 envelopes of onion soup mix. I realized after I'd started cooking the ground beef that I only had one can of cream of mushroom soup. I just added an equivalent soup can of water, and it turned out great...one of the best meals I've made in a while! And it's cheaper with only one can of soup! Your version sounds good, Meredith. My husband & I once tried substituting white wine vinegar for white wine in a recipe. Let's just say that next time we try that recipe we'll stick with the white wine! Thanks for the Allrecipes.com substitution page. I've bookmarked it. I've wondered sometimes what to use in place of brandy & I see it's on that list. I buy the peppers and onion in freezer bags at Kroger when they are on the 10 for $10.00 sale. Being able to change around ingredients is definitely a necessary ability for a queen of frugality. I can never manage to get a recipe right when I have all of the ingredients on hand. Kudos to you for being able to substitute! Ooooh, Thanks for the tips and links! I've been looking for a homemade alternative to canned cream soup for awhile now. Those swaps are a good idea- thanks for the tips! Yep, I'm a recipe tweaker, too. 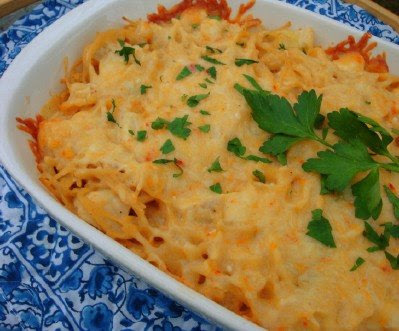 When I make my version of chicken spaghetti, I often make a cheese sauce if I don't have enough cheese! I've done that for TexMex casseroles, too. I am always swapping ingredients, but I forgot to jot it down. I can't replicate my flavors when I do this so my husband always says "whatever you did this time, write it down" :) That looks delicious! i substitute ALL the time, both for health (fruit sauce instead of oil, for example) and economy!